3. 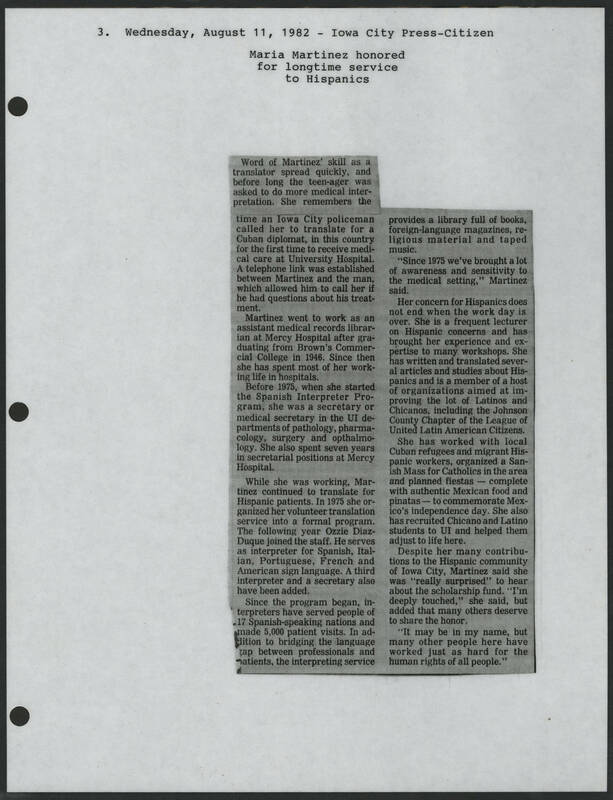 Wednesday, August 11, 1982 - Iowa City Press-Citizen Maria Martinez honored for longtime service to Hispanics Word of Martinez' skill as a translator spread quickly, and before long the teenager was asked to do more medical interpretation. She remembers the time an Iowa City policeman called her to translate for a Cuban diplomat, in this country for the first time to receive medical care at University Hospital. A telephone link was established between Martinez and the man, which allowed him to call her if he had questions about his treatment. Martinez went to work as an assistant medical records librarian at Mercy Hospital after graduating from Brown's Commercial College in 1946. Since then she has spent most of her working life in hospitals. Before 1975, when she started the Spanish Interpreter Program, she was a secretary or medical secretary in the UI departments of pathology,pharmacology, surgery and ophthalmology. She also spent seven years in secretarial positions at Mercy Hospital. While she was working, Martinez contained to translate for Hispanic patients. In 1975 she organized her volunteer translation service into a formal program. The following year Ozzie Diaz Duque joined the staff. He serves as interpreter for Spanish, Italian, Portuguese, French and American sign language. A third interpreter and a secretary also have been added. Since the program began, interpreters have served people of 17 Spanish-speaking nations and made 5,000 patient visits. In addition to bridging the language gap between professionals and patients, the interpreting service provides a library full of books, foreign language magazines religious material and taped music. "Since 1975 we've brought a lot of awareness and sensitivity to the medical setting," Martinez said. Her concern for Hispanics does not end when the work day is over. She is a frequent lecturer on Hispanic concerns and has brought her experience and expertise to many workshops. She has written and translated several articles and studies about Hispanics and is a member of a host of organizations aimed at improving the lot of Latinos and Chicanos, including the Johnson County Chapter of the League of United Latin American Citizens. She has worked with local Cuban refugees and migrant Hispanic workers, organized a Sanish Mass for Catholics in the area and planned fiestas- complete with authentic Mexican good and pinatas - to commemorate Mexico's independence day. She also has recruited Chicano and Latino students to UI and helped them adjust to life here. Despite her many contributions to the Hispanic community of Iowa City, Martinez said she was "really surprised" to hear about the scholarship fund. " I'm deeply touched," she said, but added that many others deserve to share the honor. " It may be in my name, but many other people here have worked just as hard for the human rights of all people."